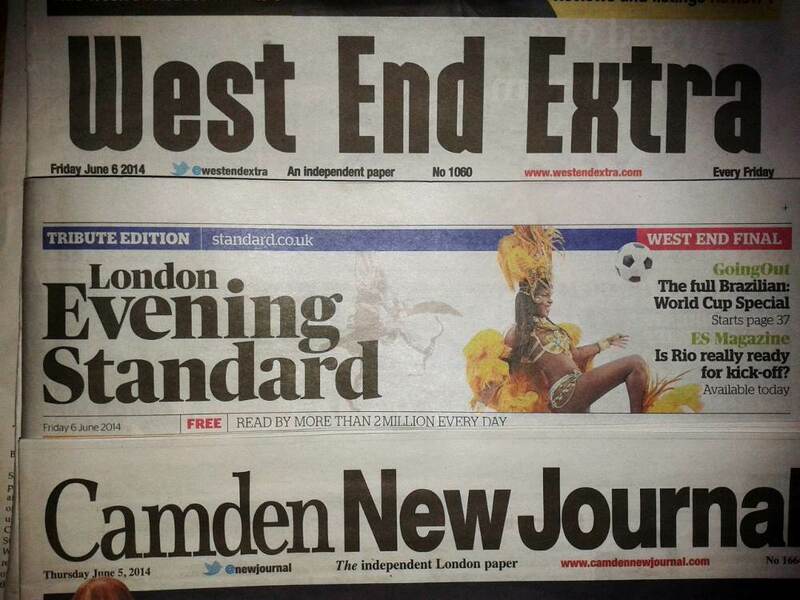 Fitzrovia has new distribution points for weekly papers the Camden New Journal (Thursdays) and its Westminster sibling the West End Extra (Fridays). The CNJ can be collected from the corner of Goodge Street and Whitfield Street. It is also available outside the Fitzrovia Community Centre in Foley Street where you can also get the WEE, Time Out and Fitzrovia News from a distribution bin. Weekly papers Camden New Journal, West End Extra, and Time Out are available at Fitzrovia Community Centre. The London Evening Standard is available at all tube stations every week day afternoon. This week’s CNJ says that Waiting for Dobbo is to end shortly with the MP for Holborn and St Pancras about to announce he’s going to give up the safest of Labour seats to another hopeful. Deputy editor Richard Osley reports that there will be greater competition to select a Labour candidate for Frank Dobson’s throne than next year’s parliamentary contest itself. Osley’s blog post earlier in the week is worth a read, too. Our three elected Bloomsbury councillors — Sabrina Francis, Adam Harrison and Rishi Madlani — have a letter in the CNJ about their campaign to save the Post Office in Russell Square. It also serves residents on the eastern side of Fitzrovia (the Gower peninsula) so please show your support by signing. Dan Carrier reports in the CNJ on a “windfall” for community groups in Fitzrovia due to the largesse of “multi-billion pound property empire” Derwent London. Carrier notes that Derwent controversially won planning permission to develop the Saatchi block in Charlotte Street “in the face of stiff opposition from residents and the Town Hall”. While this year’s recipients of grants are not named one of last year’s successful applicants Fitzrovia Youth in Action is mentioned and quoted as speaking highly of Derwent and their relationship with the local community. “They are setting a good example to other businesses and property developers in ways to engage with the area they are based in,” says Fitzrovia Youth in Action co-ordinator Andre Schott. What Carrier didn’t mention is that in 2011 Dr June Crown chair of Fitzrovia Youth in Action urged Mayor Boris Johnson to approve Derwent’s plans for the Saatchi building. William McLennan in this week’s West End Extra reports on how a street warden of 17 years service has been sacked by Westminster City Council. The whistleblower and trade union representative took papers allegedly proving malpractice at the council and wanted to expose the wrong-doings. The WEE also reports on the new language in use at Westminster City Council after leader Philippa Roe announced her new cabinet. West End ward councillor Jonathan Glanz gets a dishonourable mention. Meanwhile the Standard, which can be collected from various points in the neighbourhood, reported on Monday that the flats at Exemplar’s Fitzroy Place are apparently selling at around £1900 per square foot and that 232 of the 235 have now been sold. Exemplar director Daniel Van Gelder is so happy that he’s decided to buy one of the eye-wateringly expensive apartments for himself and family. “What a bonus for the neighbours to have their landlord on site if they have any issues,” chirped the Standard‘s City Spy. Well there is of course one outstanding issue not mentioned by the Standard and that is Exemplar’s desire to re-brand the Grade II* listed Middlesex Hospital Chapel. While Gelder is boasting of his purchase of a pad for himself and family, his two fellow directors Messrs Bucknell and Younger are staying rather tight-lipped about this outstanding matter despite our three-month campaign. An announcement about the chapel is due in the summer, apparently. On Wednesday the Standard reported on the proposed changes to Tottenham Court Road and Gower Street. Instead of leading with a picture of Tottenham Court Road the article on their website featured a picture of Oxford Street. Time Out has offices on Tottenham Court Road and there was a blog post about the plans. Beyond the gloss they saw fit to comment: “Bung as many earplugs as you can find in the post to Time Out Towers. When those pneumatic drills start doing their thing, we’re gonna need ‘em”. But by the time Camden starts tearing up the tarmac it will be time out for Time Out as their building of 21 years is due to be demolished and redeveloped at the end of this year in a scheme by Exemplar, The Bedford Estates and Ashby Capital.